We all love sweets. They are a fundamental component of human interactions and connections, such as for birthday celebrations, holiday parties, and special Sunday mornings. The sour side of sweet is that too much sugar can take a toll on our health over time, and more immediately, make us not feel too good after eating. As the holidays approach, we may be tempted to indulge in the delights that our families, friends, and coworkers share with us. Imagine having go-to healthy recipes that satisfy our sweet tooth while providing nutrition. Having some healthy recipes in our arsenal will equip us to efficiently prepare tasty treats that benefit our health and satisfy our soul. Make peace with dessert, for a healthy relationship with food in our flour power challenge . 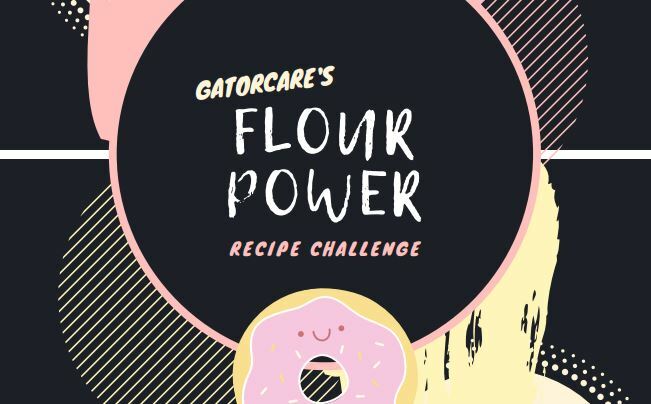 GatorCare challenges you to create a dessert with NO white (all-purpose) flour! Why? While white flour based desserts make up some of our favorite sweet treats, there are so many other nutritious ingredients, which contain fiber, antioxidants, and vitamins, that can be used to make delicious desserts to support heart health and maintain steady blood sugar levels. Oat flour, almond flour, spelt flour, buckwheat flour, coconut flour, flourless! (such as beans, avocado, peanut butter, or sweet potato), and many more. So what are you waiting for? Start brainstorming what your ideal healthy dessert would look like! Experiment in the kitchen and make that last course one worth waiting for. 1. Eligibility: Participants must be a UF or UF Health employee. Submissions may be original recipes, or you may use other recipes for inspiration, but you must make your own unique ingredient changes in order for the recipe to be considered. Participants may enter up to five unique, healthy recipes. Get creative! 2. How to enter: Contest begins on Monday October 1st, 2018 and all entries must be submitted by Wednesday October 31st, 2018. Recipe submissions are to include a description, ingredients, directions, and photo. Does your recipe contain healthy substitution(s) for all-purpose flour? Does your recipe contain other nutritious ingredients? Does this recipe taste great with every bite? Would you want to make this recipe over and over again based on taste alone? Have others tried it and liked it? Does it contain interesting, yet gratifying flavor combinations? Does the recipe show well on a plate or in a bowl? Do your eyes make you want to eat this recipe before you even smell or taste it? Have you incorporated your personal touch to this recipe? Is this recipe reflective of unique twists to ingredient usage? Is this recipe easy to make? Are ingredients easy to acquire? 4. Winners and prizes: Winners will be notified by Friday November 9th, 2018. Top 25 recipe submissions will be featured on GatorCare’s website. Top three recipes will be chosen as winners of the contest and win a customized GatorCare culinary nutrition kit including healthy treats for snacking and baking! Curious about sugar intake over the long-term? Check out the the lowdown on sugar highs. Not sure where to start? Do some research online for flour substitutions. Healthy whole grain flour review including information for storage and usage in various culinary applications. King Arthur Flour provides a guide for baking with ancient grains.